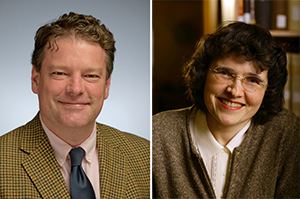 Two faculty members from the University of Notre Dame’s College of Arts and Letters have won 2016 fellowships from the American Council of Learned Societies. Kathryn Kerby-Fulton, the Notre Dame Professor of English, will pursue a book project that explores the notes that medieval readers made in the margins of historic texts and books in order to rediscover sophisticated early reading practices for understanding the self. Christopher Ball, an assistant professor of anthropology, will spend time with an indigenous tribe in Brazil studying local history and culture through connections between language and nearby rivers. The ACLS, the pre-eminent representative of American scholarship in the humanities and social sciences, conferred just 69 fellowships from a pool of more than 1,100 applicants. Kerby-Fulton said the awards, which provide funding for up to one year for research in the humanities or social sciences, are invaluable for helping large-scale projects become reality. While such a practice is discouraged in shared books today, medieval readers often made notes in the margins of texts — which proved invaluable for others who struggled with some of the concepts or references. Now, Kerby-Fulton mines those notes for clues about how people of the time read and understood the texts. The Middle Ages is one of the most candid of literary periods on this subject. Endlessly analyzing the self with forensic accuracy (and with remarkable parallels to modern mapping of the brain), medieval writers and annotators probed the inner workings of the mind via classical, Arabic and biblical models. Kerby-Fulton, whose project is tentatively titled “Medieval Interiorities and Modern Readers: Recovering Medieval Reading Practices for Understanding the Self,” is especially interested in texts that analyze the self, such as St. Augustine’s Confessions, which outlines the internal struggle of a saint before and after his conversion to Christianity. “These writings were all different methods for understanding the self and understanding how the mind works to solve during meditation, contemplation and spiritual experiences, including dreams and visions,” Kerby-Fulton said. Kerby-Fulton also studies religious and political censorship, apocalypticism, visionary writing, women’s mysticism, and dance history and contemporary dance criticism. She is author or co-author of four books, including “Books Under Suspicion: Censorship and Tolerance of Revelatory Writing in Late Medieval England,” which won the Medieval Academy of America’s Haskins Gold Medal and the North American Conference on British Studies’ John Ben Snow Prize. Ball, a linguistic and cultural anthropologist, will spend time next year on and around the Xingu River in northern Brazil with the Wauja, an indigenous tribe that lives in a protected part of the rainforest. Ball is one of fewer than 400 people who speak the Wauja language. He is interested in documenting the stories, in their native tongue, that are most important to the tribe’s history and culture. His project, “Language and Riverscape in Indigenous Brazil: Mapping Cosmology and Politics of Place,” will involve working with older tribal members to map the important spiritual and historical places along the Xingu River while collaborating with Wauja youth to take photographs and record audio and video of the stories associated with those places. The final product of his work will include an interactive map in which tribal members can access the videos, audio recordings and photos, preserving the Wauja culture and history. Originally published by Brian Wallheimer at al.nd.edu on April 13. Originally published by Brian Wallheimer at al.nd.edu on April 13, 2016.